When Mark Bater was a kid, he and his friends had a Halloween party. Everyone was enjoying the holiday fun, when Mark’s father interrupted things and severely criticized his son’s apple-bobbing technique. The man takes bobbing for apples very seriously. So seriously, in fact, it led to Mark becoming a murderer. After jumping ahead 10 years, then again 2 years, now Mark lives in an old mansion with his grandmother (and now Mark is played by Addison Randall). When four teens on the way to a rock concert get convinced by the local costume shop owner to deliver costumes to his house, they find themselves being stalked and killed one by one by Mark, who dresses up in various outfits and takes on various personas as he does his killings. Will the local police get wise to what’s going on at Hollow Gate? Pepin, Merhi, and the gang at City Lights strike again. This time they’re trying their hand at a horror movie, seemingly at this point in their careers sampling a bunch of different genres to see which fits best. As it turned out, action movies were their forte, and PM more than proved that. But maybe at this point in time, that future wasn’t so clear, so they tried different styles to get a hold of the booming video market of the day. The result is Hollow Gate, a silly and amateurish movie, but fans of 80’s horror may still be interested. None of the actors that portrayed the teens in trouble (Katrina Alexy, Richard Dry, Patricia Jacques and J.J. Miller) went on to any other City Lights or PM movies, or really anything else at all. Out of all of them, we felt Richard Dry could have had an acting career, and seeing as how we called him “Egon” during the movie, he at least could have played a young Harold Ramis in any of his projects. But the standout star here is unquestionably Addison Randall, who unsubtly plays the psychopath with gusto, and shows a lot of range with his various murderous “characters”. Randall maintained his relationship with PM, acting, writing, and doing various other jobs with them. He even directed Lawrence Hilton-Jacobs in Chance (1990) and the one and only Malibu in The Killing Zone (1991). 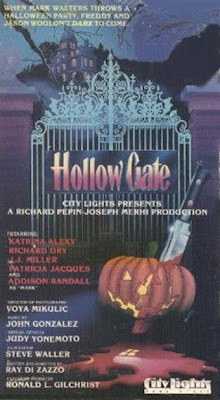 Hollow Gate isn’t exactly scary, but it once again shows determined people, pursuing their dream of making a career in the movie industry. Yes, there is a ton of stupidity on display, and whatever isn’t totally derivative makes absolutely no sense, but it shouldn’t be judged too harshly, in our opinion. 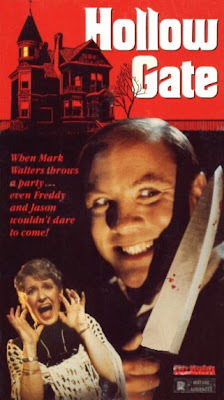 This was a pretty entertaining slasher with some funny moments. Agreed. Very solid horror flick! We are happy you enjoyed it.